Eighteenth Century English poet Alexander Pope said, “Hope springs eternal in the human breast.” That can be interpreted to mean that humans continually look for a reason to be optimistic. In Michigan, there’s a wonderful reason for hope to spring, Spring! Warmer weather, longer periods of sunshine and beautiful blooming landscapes greet those who have been cooped up indoors for the last several months. But the changing season isn’t the only reason to be optimistic. Freedom gives all of us the opportunity to pursue happiness and create a better world for ourselves. The Mackinac Center gives liberty a voice in the realm of public policy. To be effective, organizations not only have to be right, they have to be persuasive. In this issue of IMPACT, you’ll read about the effectiveness Arthur Brooks is having in the freedom movement. He’s the president of the American Enterprise Institute and recently spoke at a Mackinac Center event. He stresses that those who want to be persuasive have to be for people, rather than simply against things. You’ll read about a document the Mackinac Center submitted to the Supreme Court in support of California teachers who wish to have a choice regarding whether to pay union dues to keep their jobs. You’ll read about three Taylor teachers who, with the help of the Mackinac Center Legal Foundation, stood up against a union and won the freedom to choose whether to financially support that union. This year marks the fifth year of Michigan Capitol Confidential’s digital product. The news service of the Mackinac Center represents the electorate above the elected and tells stories from the perspective of the governed rather than the government. Numerous mainstream national media outlets have cited the award-winning CapCon team over the past five years. Before you head to the polls on May 5, read what Assistant Fiscal Policy Director James Hohman discovered while researching Proposal 1. The Mackinac Center Legal Foundation fought for the public’s right to public information in its lawsuit with the Michigan Liquor Control Commission. The MLCC charged the Mackinac Center more than $1,550 for documents that could have been easily transferred to a flash drive. The MCLF sued and got the charge down to around $50. The Mackinac Center fights for the rights of parents to send their children to the school of their choosing. Recently, the center hosted a telephone town hall, reaching out to tens of thousands of people and educating respondents on the issue of school choice. I buried the lead. 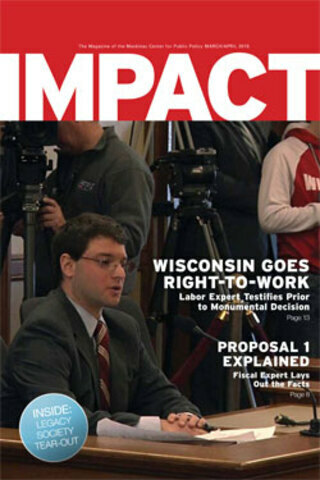 The Mackinac Center welcomes Wisconsin to the right-to-work club. Prior to the Badger State becoming the country’s 25th right-to-work state, Mackinac Center Director of Labor Policy F. Vincent Vernuccio testified for a Senate public hearing about the advantages of right-to-work. These stories, and the nicer weather to come, should give you plenty of reasons to be optimistic.